WEST LAFAYETTE, Ind. - A new automated system detects cracks in the steel components of nuclear power plants and has been shown to be more accurate than other automated systems. "Periodic inspection of the components of nuclear power plants is important to avoid accidents and ensure safe operation," said Mohammad R. Jahanshahi, an assistant professor in Purdue University's Lyles School of Civil Engineering. "However, current inspection practices are time consuming, tedious and subjective because they involve an operator manually locating cracks in metallic surfaces." Other automatic crack detection algorithms under development often do not detect cracks in metallic surfaces because the cracks are usually small, have low contrast and are difficult to distinguish from welds, scratches and grind marks. 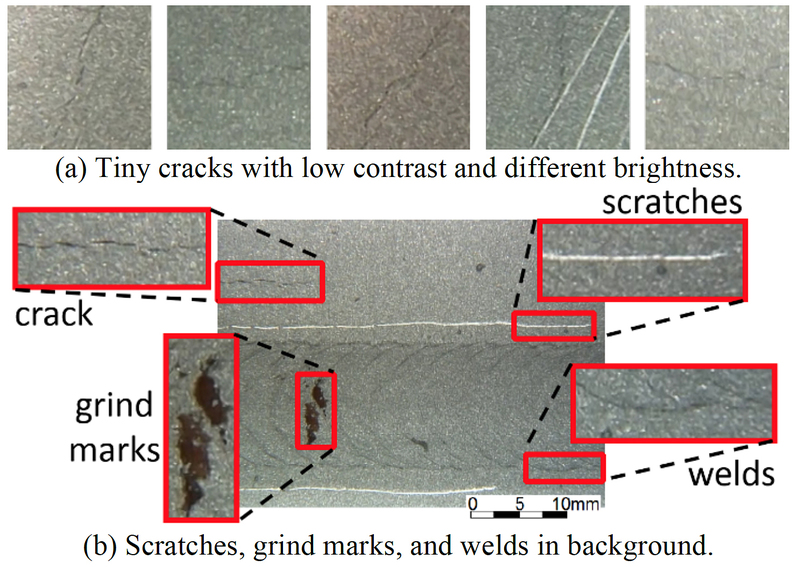 The new system, called CRAQ, for crack recognition and quantification, overcomes this limitation by using an advanced algorithm and a powerful "machine learning" technique to detect cracks based on the changing texture surrounding cracks on steel surfaces. Findings are detailed in a research paper published this week in Computer-Aided Civil and Infrastructure Engineering. The paper is available online at http://onlinelibrary.wiley.com/doi/10.1111/mice.12256/full. The automated approach could help improve the state of the nation's infrastructure, recently given an overall grade of D+ by the American Society of Civil Engineers, he said. "One reason we have a grade of D+ for the infrastructure is insufficient inspection," said Jahanshahi, director of Purdue's Smart Informatix Laboratory. "So we want to have more frequent inspection using robotic systems to collect data." The nation operates 99 commercial nuclear power plants, which account for about 20 percent of total U.S. electricity generation. Aging can result in cracking, fatigue, embrittlement of metal components, wear, erosion, corrosion and oxidation. "Cracking is an important factor in aging degradation that may cause leaking and result in hazardous incidents," Jahanshahi said. "For instance, the Millstone nuclear power station in Connecticut had an accident in 1996 that was caused by a leaking valve, and the accident cost $254 million. In 2010, the Vermont Yankee Nuclear Power Plant had an accident where deteriorating underground pipes leaked radioactive tritium into groundwater supplies, resulting in $700 million in damage." "Consequently, direct manual inspection of reactor internals is not feasible due to high temperatures and radiation hazards," Jahanshahi said. "So remotely recorded videos at the underwater reactor surface are used for inspection. However, recent testing has identi?ed a need for increased reliability associated with identifying cracks from reviews of live and recorded data. The results indicate that this capability is degraded by human involvement in identifying cracks, even when identi?cation should be easy." "In contrast to other methods that only focus on detecting cracks in one image, we propose a method called Bayesian data fusion that tracks detected cracks in video frames and fuses the information obtained from multiple frames," Jahanshahi said. "Moreover, we can ?lter out falsely detected cracks and increase the reliability and robustness of crack detection by using Bayesian decision theory," which determines the probability that an object is a crack or a false alarm. The system assigns "con?dence levels" automatically assessing whether the detected cracks are real, outlining the cracks with color-coded boxes that correspond to these confidence levels. For example, if the algorithm assigns a high confidence level to a crack, the box outline is red. The processing procedure takes about a minute. "Then, a technician could do a manual inspection to confirm that there is a crack," Jahanshahi said. A YouTube video is available at: https://youtu.be/b87OgGBIR78. The research paper was authored by doctoral student Fu-Chen Chen; Jahanshahi; doctoral student Rih-Teng Wu; and Chris Joffe, technical leader for Non-destructive Evaluation at the Electric Power Research Institute (EPRI), a nonprofit organization funded by the electric utility industry. "We are currently working on the second version of the software by developing deep learning algorithms to detect cracks for this application where we have significantly improved the performance of the system using Constitutional Neural Networks," Jahanshahi said. The first aerial assessment of the impact of South Sudan's current civil war on the country's wildlife and other natural resources shows that significant wildlife populations have so far survived, but poaching and commercial wildlife trafficking are increasing, as well as illegal mining, timber harvesting and charcoal production, the Wildlife Conservation Society (WCS) said in a report issued today. The failure of federal watchdog agencies to require admissions of guilt from the targets of civil enforcement can trigger calls for greater accountability from the public, says a new paper from U. of I. law professors Verity Winship and Jennifer K.
Muhammad Elgammal, P.E., PMP, a 27-year-old associate civil engineer at The Port Authority of New York and New Jersey, will be honored tonight at an American Society of Civil Engineers (ASCE) gala in Arlington, Va., as one of the organization's 10 'New Faces of Civil Engineering' for 2017. The participation of civil society organizations in the international REDD+ programs seeking to reduce deforestation, forest degradation and CO² emissions could play a key role in enhancing collaboration between local and international natural resources governance actors in Laos. Thanks to a recent award by the Center for Produce Safety (CPS), a researcher at the University of Pittsburgh's Swanson School of Engineering will investigate whether crAssphage can indicate contamination in water used for irrigating crops. Since 2011 the Syrian Civil War has led to one of the most complex humanitarian emergencies in history.